Our program is designed to train residents to hone their discriminating abilities, acquire clinical knowledge, and master the art of skillful, independent, and confident clinical decision-making by the time they graduate. The principal goals of our program include mastery of psychiatric evaluations and optimal management of both therapy and medication based approaches. Our residents are exposed to a variety of rotations across multiple sites, each offering different clinical experiences. Residents rotate through the following sites which expose them to diverse patient populations across a multitude of socio-economic and cultural backgrounds. UH is a separate, independent medical center with 519 licensed beds, an active medical staff of more than 600 and more than 3,100 employees. It is a regional resource for advanced care in a wide range of medical specialties. UH is home to northern New Jersey’s Level-I Trauma Center and to specialty programs such as the Center for Liver Diseases and the Comprehensive Stroke Center. VA New Jersey Health Care System (VANJHCS) is a consolidated facility comprised of two main campuses, one in East Orange, and one in Lyons, 22 miles to the west of the East Orange Campus. Primary care is the emphasis at the VANJHCS. Veterans are assigned their own health care providers who they see on a regular basis. Access to a wide variety of specialists is available through the primary providers. In addition to general medical, psychiatry, and long-term care, a full range of medical and surgical subspecialty care is provided to veterans of the VANJHCS through a variety of special programs. HUMC is a 900-bed non-profit, research and teaching hospital located 7 miles west of New York City, in Hackensack, Bergen County, New Jersey. HUMC provides tertiary and healthcare needs for northern New Jersey and the New York metropolitan area. HUMC is New Jersey's largest provider of inpatient and outpatient services and is the fourth largest hospital in the nation based on the number of admissions. HUMC is affiliated with the New Jersey Medical School of Rutgers University. Greystone Park Psychiatric Hospital is a 552-bed psychiatric hospital serving a designated New Jersey population. The new hospital opened on July 16, 2008 and is located in North Central New Jersey in Morris Plains. Residents rotate in GPPH in their PGY-III and/or PGY-IV years. The main goal of this rotation is to learn skills in the treatment of chronically ill patients from a geriatric population. This facility also provides exposure to forensic psychiatry. The maiden (intern) year consists of a half year rotation in psychiatry and a half year rotation in neurology and medicine, with an optional rotation in pediatrics. Some of the residents start with psychiatry; the others start with medicine or neurology. The Psychiatry rotation is an introduction to inpatient psychiatry, interviewing techniques and documentation. Residents rotate through UH, EOVA and HUMC. Residents ease into in-house calls with “buddy calls” where they are paired with senior residents for the first few calls. They learn history-taking, documentation, decision making, and system-based learning. After 1 or 2 buddy calls, each PGY-I starts “supervisory calls” where they take increasing responsibility in the calls in the presence of a senior resident. For most PGY-I residents, their first independent call comes after at least 5 buddy/supervisory calls. The maximum call duration on weekends is 12 hours. Each PGY-I resident gets one golden weekend a month with no calls. We do not have PGY-Is take independent calls for at least the first four weeks of their residency. Neurology is a two 4 week block rotation for the acquisition of knowledge of neurological evaluations and treatments. The residents rotate through EOVA and UH during which they rotate through a dedicated and fully accredited stroke service, an epilepsy service, a general neurology service and outpatient clinics. The neurology rotation typically involves a co-resident and a senior resident, including on call days. The Medicine rotation consists of four 4-week blocks. The focus is on the development of the basic medical skills and training necessary as a medical provider. The residents rotate at EOVA or UH. Residents get one 4-week block of ambulatory exposure while rotating through EOVA. Typically, there are no solo calls and a resident’s team consists of one or two co-residents and a supervising senior medical resident. The department is able to arrange for an optional rotation in pediatrics for two 4-week blocks in conjunction with the pediatrics team. The team includes a senior resident. Both inpatient and emergency rotations are availed of at UH. Residents get exposure to pediatric neurology and pediatric psychiatry through the course of the rotation. The PGY-II year consists of rotations in EOVA, UH, HUMC and sometimes, UBHC. Residents are also introduced to Consultation-Liaison Psychiatry, Emergency Psychiatry and Outpatient Psychiatry. 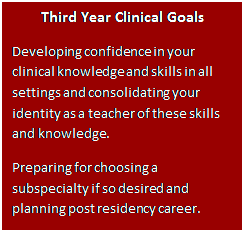 Residents build on skills learned in PGY-I year and develop a more in depth approach to patient care. Residents learn Consultation-Liaison Psychiatry at UH and HUMC. This rotation teaches residents the fundamentals of psychiatric consultation in a primary care hospital setting. Both of the sites are busy with a high demand for psychiatric consultations. Residents learn to work with other teams and develop expertise in evaluating psychiatric symptoms in medically ill patients and to offer appropriate psychotherapeutic and psychopharmacologic interventions. The Emergency Psychiatry experience is based in UH and can be a month-long or two-month long rotation. This is one of our busiest services and provides both a wide range and depth of exposure to various patient presentations. Here, PGY-II residents focus on rapid diagnostic assessments of adult and child patients with acute mental health issues. Residents work in collaboration with a multidisciplinary team under the direct supervision of an attending psychiatrist. Full-time outpatient clinic experience starts in PGY-II for some residents. The focus is on evaluating and treating patients and the use of psychopharmacology and psychotherapy in outpatient settings. Also, it is in the second year that all PGY-II residents start picking up their own outpatient psychotherapy patients who they see in their own offices simulating outpatient private practice. They continue providing psychotherapy to these patients until they graduate. PGY-II calls, less frequent than in the PGY-I year, provide an opportunity for expanded responsibilities and professional growth, as residents cover the inpatient psychiatry service and provide consultation services to the ER and to the general medical and surgical floors. PGY-II residents also provide supervision to PGY-I residents during the latter’s buddy and supervisory calls. 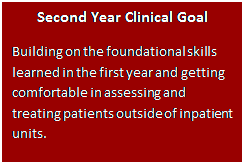 The core focus for the PGY-III residents who started their longitudinal outpatient psychiatry experience in the second year is completing it. The core focus for the ones who did not is starting the longitudinal outpatient psychiatry experience. Outpatient exposure can be received in variety of clinical sites and settings including HUMC, VA, Integrity House and UBHC. The site assignments for outpatient rotations take resident requests in consideration. The emphases during outpatient rotations are to ensure continuity of care and to develop a good therapeutic alliance with patients through longitudinal follow ups. Residents are provided with the right balance of supervision and autonomy that will equip them to face clinical challenges in the future. The PGY-III year can also include exposure to consultation and liaison psychiatry, emergency psychiatric services and inpatient experiences. During this, year residents also continue with the UPOC clinic with a greater patient load and more responsibilities. Residents learn a wide variety of psychopharmacological interventions and receive extensive clinical training in CBT, psychodynamic, and supportive psychotherapies with supervision by senior psychotherapists. PGY-III calls are much less frequent than in the PGY-I and PGY-II years with many more golden weekends. PGY-III residents also provide supervision to PGY-I residents during their supervisory and buddy calls. The PGY-IV year prepares residents for the next phase of their carrier. 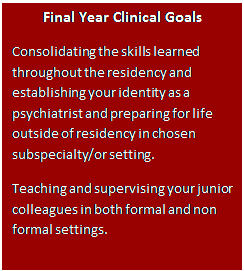 The cores of this year are mentored-training and academic work in individualized area(s) as residents develop expertise and readiness for independent psychiatric practice and directed professional growth. This is further amplified by the development of autonomy and identity. Each PGY-IV resident works with the program director to develop their clinical schedule. Usually, 6 months are dedicated to finishing any core requirements that may not have been completed. The remaining 6 months are used as a combination of elective and selective time providing each resident with an opportunity to define and pursue a concentrated focus. The elective time (2 months) may be used in clinical, research, teaching, or administrative settings. Most of the clinical sites/rotations are available to be used for the selective time (4 months). During the PGY-IV year residents also continue with the UPOC clinic with a lower patient load but with greater focus on building their psychotherapy and psychopharmacological skills. UPOC clinic provides residents with the experience of working with a few patients for 3 years – preview of the real world experience of psychotherapy. Each PGY-IV resident also spends a few hours a week teaching and mentoring PGY-I residents. There is no individual On-Call in PGY-IV. Each PGY-IV resident provides supervision to a PGY-I resident in a daytime supervisory call for a total of 6 supervisory calls per year.